Today is the 77th anniversary of the global Bank Shuttering that was initiated by President Roosevelt in reaction to the crisis that engulfed the system at that time. I thought today was an appropriate day to look back at events surrounding those dark days of 1933 for parallels today. What I see resonates eerily. The Great Depression in 1929 triggered a series of events that had unintended global secondary and tertiary consequences. As always, the invisible hands of Haphazard Linkages and Reflexivity ensure that seemingly harmless stimuli set off a chain of rippling consequences that spread out rapidly. While circumstances, market characteristics and regimes shift over time, there is an element of temporal neutrality to man-made economic and financial disasters. Often, I have found practical lessons in economics, markets and human behavior residing in the treasure trove of history. 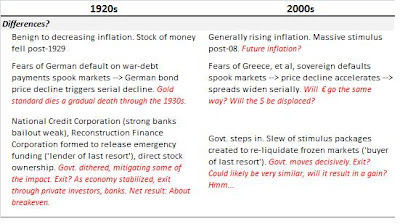 I turn first to similarities between the build-up of events through the 1920s and the 2000s decade. The table is mostly self-explanatory. 20s Smartie: We have the Gold Standard, inflation's dead and credit is easy. The war? Well, that's history. Long forgotten. We guys have a short memory. Its the age of booms; real estate, stocks, bonds...what are you doing Sir? 00s Smartie: We have securitization, pack-n-sell products, move-em-risk products, CDO, CDO-squareds, CDS, trend following algorithms, inflation who?, credit is easy. Risk? Well, that's history. Long forgotten. We guys have a short memory. Its the age of booms; real estate, stocks, bonds, commodities, things-I-can't-remember-or-name...what are you doing Sir? There was no securitization, no razmataz, no hedge fund quant demons thirsting after mispricing back in the 1930s and yet...the boom-bust cycle played out. 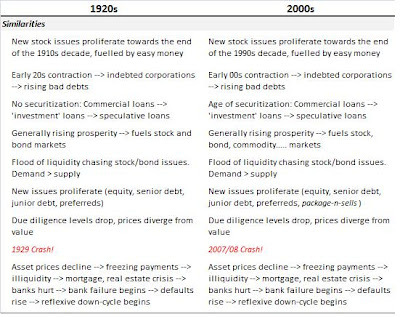 Nearly 80 years down the line market sophistication (and the jargon) has increased manifold, engineering has been extended to the realm of finance and new products allow investors access to asset classes that a 30s charlatan could only dream about. But something is structurally and mentally constant in us human beings. The temporal overlap above may be coincidental but the behavioral pattern is perceptively self-evident. With the ever-so-faithful benefit of hindsight, it is easy to point a finger at the government back in the 1930s for acting too belatedly in tackling the crisis. It is important to recognize that the guys back then were uneducated in Depression history. But this time its different, isn't it? It always seems like it is....but is it? 1930s: The Reconstruction Finance Corporation was setup, capitalized with $2 billion, to extend credit to lubricate the frozen markets. The government eventually took stakes in institutions, infusing money to invigorate the sickly economy. President Roosevelt's rousing swearing in seemed to do the trick as far as emotional will was concerned. As the economy rebounded, the government exited through stake sales to private investors and/or banks. Best estimates point to a break-even on this trade for the government. Adjusted for inflation, tax-payers lost a bundle. The 1930s was characterized by the rise of economic nationalism, bloc economies, trade protectionism and a move towards unilateral policy setting, factors that are absent today. 2010s? : A slew of stimulus packages, within kissing distance of $1 trillion, instituted to stimulate the economy. The governments - learning from history - acted speedily and decisively in concerted action to arrest the downturn. A few observations before rounding out. While it looks very likely that the pattern of exit will resemble the 1930s, timing is the uncertain variable. Exit too early and you jeopardize a nascent recovery. Exit too late and you stoke monsters (hyperinflation, credit glut, asset price bubbles etc.). Inflation behavior was a divergence between the 1920s and 2000s. Inflation back then was rather benign and on a gradual downtrend. Contrastingly, inflation was generally rising through the past decade and the massive monetary infusions almost certainly will stoke inflation in the near/medium term. Some of the biggest problems confounding global politics today is the interconnected problems experienced by peripheral countries in the Euro zone. Should Greece (and others?) be bailed out? What are the omens for the Euro? Indeed, can it survive as a currency? If yes, would this necessitate massive structural changes to the very fabric of the EU system? The big lessons from history is that while regimes change and markets evolve, certain things remain timelessly constant. It is impossible to predict the next bubble-pop with any degree of accuracy. But it is fallible human beings who make policies, economies and it is fallible human beings who participate in the markets. Contrary to opinion, I think trend-following algorithms are fallible too. In a paradoxical way, the only thing that can be predicted with conviction is the repeat of emotional excesses that has afflicted human beings through centuries. The low interest rates of today are very likely to sow the seeds of a bubble in one or more asset classes, which will pop at some point in the future. It would be folly to blame the causes of that bust to 'low interest rates'. The low interest rate environment is a necessity today given the present state of the economy. If it sets off a bubble elsewhere, it is haphazard linkages at work. The more things look different, the more they look the same...and the more things look the same, the more they look different. "As a group, bankers have demonstrated repeatedly their incapacity and greed, and yet in their hands has rested the decision to say who shall have credit, what manufacturer or merchant shall control goods and how much. They have misued that power, they have shown that banking should no longer be left in the hands of irresponsible private groups. The emission of credit, to be constant and sound, must be supervised from the standpoint of its public welfare rather than of private profit." We live through interesting times.